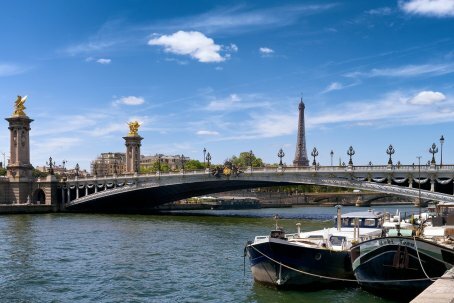 In the north of the country on the river Seine, Paris has the reputation of being the most beautiful and romantic of all cities, brimming with historic associations and remaining vastly influential in the realms of culture, art, fashion, food and design. Dubbed the City of Light (la Ville Lumière) and Capital of Fashion, it is home to some of the world's finest and most luxurious fashion designers and cosmetics. A large part of the city, including the banks of the Seine, is a UNESCO World Heritage Site. The city has the second highest number of Michelin-starred restaurants in the world (after Tokyo, which is much larger) and contains numerous iconic landmarks such as the Eiffel Tower, the Arc de Triomphe, Notre-Dame de Paris, the Louvre, the Moulin Rouge and the Basilique du Sacré Cœur, making it one of the most popular international tourist destinations in the world, with around 14 million tourists annually.